Muscat, Jan 27 (ONA) ---Wayne Pearce, CEO of Oman Air said that he has been attempting, since taking over as CEO, to ensure the type of excellent services to be worthy of the Sultanate's national carrier by focusing on running all administrative and financial affairs in a very perfect manner. 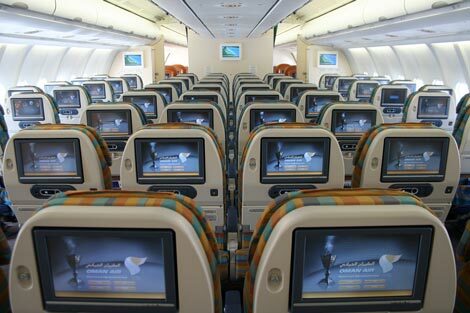 Speaking to Oman News Agency (ONA) Pearce said that Oman Air has recently achieved a big success after launching many direct flights to a number of touristic destinations, the fact which called for expansion of our fleet. The company has put orders to buy 6 Boeing 787 Dreamliner planes, due to arrive in 2015, in addition to 6 Boeing 737 planes. Responding to a question about Oman Air new touristic destinations, Pearce said that the company will open new routes, among them Muscat -Moscow route whose inauguration has been postponed for feasibility restudy purposes. The route needs more studies before scheduling its inauguration. Regarding how convenient schedules of Europe flight to other routes, Oman Air CEO said that the company puts into consideration that timing of flights coming from Europe should fit with those departing to Asian destinations. The European tourists coming from Europe stop at Muscat Airport to take connection flights to their Asian destinations without the need to wait for long times. Pearce attributed the reason for opening a direct Muscat-Zurich route to the availability of many Swiss tourists who prefer flying to Muscat and to the fact that Zurich is the biggest city in Switzerland and its population is bigger than that of the capital Geneva, in addition, the number of passengers and flights through Zurich airport are more than those using Geneva airport. He stated that marketing department at Oman Air spares no effort in promoting this route in collaboration with international marketing companies. A number of Swiss news media will be invited to visit the Sultanate to have a firsthand experience on cultural, touristic and civilizational opportunities Oman has, along with Oman Air participation in events and activities in collaboration with Tourism Ministry. Pearce said that the company has carried out marketing and promoting efforts to ensure the success of Muscat-Zurich route. A number of meetings with Swiss travel and tourism companies were conducted and many partnership agreements were signed with those companies to acquaint them with the touristic, cultural and historical potentials the Sultanate has and more specifically to acquaint these companies with the facilities and services provided by Oman Air to Swiss tourists wishing to visit the Sultanate. Oman Air CEO added that the company has publicized, through its "Oman Air Holidays " partnership with Bahwan Travel Agencies, its promotions on Muscat-Zurich route to activate traffic on this route by attracting more touristic groups from Switzerland in particular and Europe in general. He affirmed that these efforts have proven fruitful since after one month of operation the route has seen a good passenger turnout as the booking rate has reached 60%. He stressed that the company hopes to have full flights on this route.